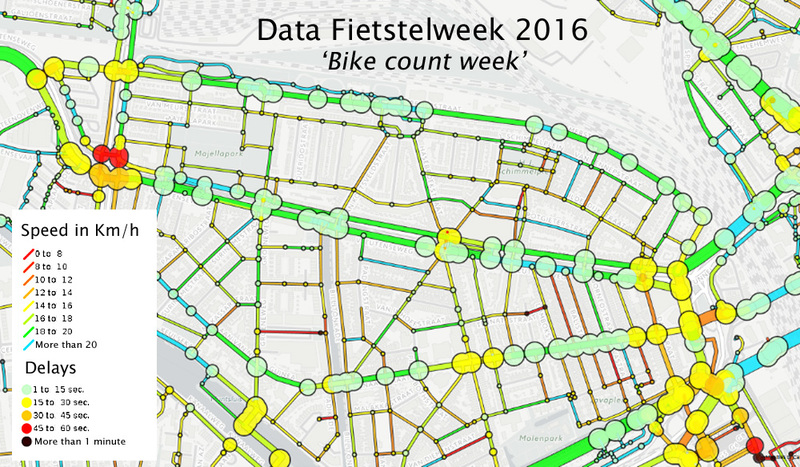 Utrecht continues to improve its cycling network. Just two weeks ago another new route for uninterrupted cycling was opened as an alternative to an existing cycle route alongside a busy arterial with many traffic lights. Not so much to make cycling even quicker, but more to offer a viable alternative further away from traffic. That makes this new route attractive and safe. It also gives people the choice to take a route they feel is best for their needs. 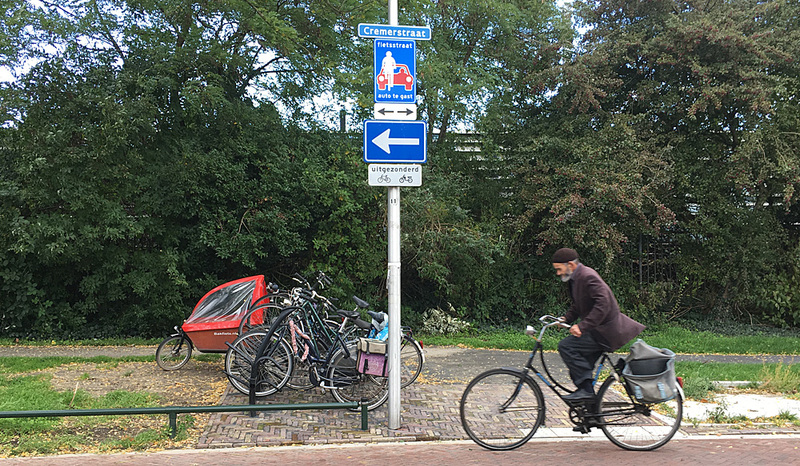 A man cycling past the new signs in Cremerstraat in Utrecht stating it is a cycle street now: in both directions for cycling, in just one direction for motor traffic. 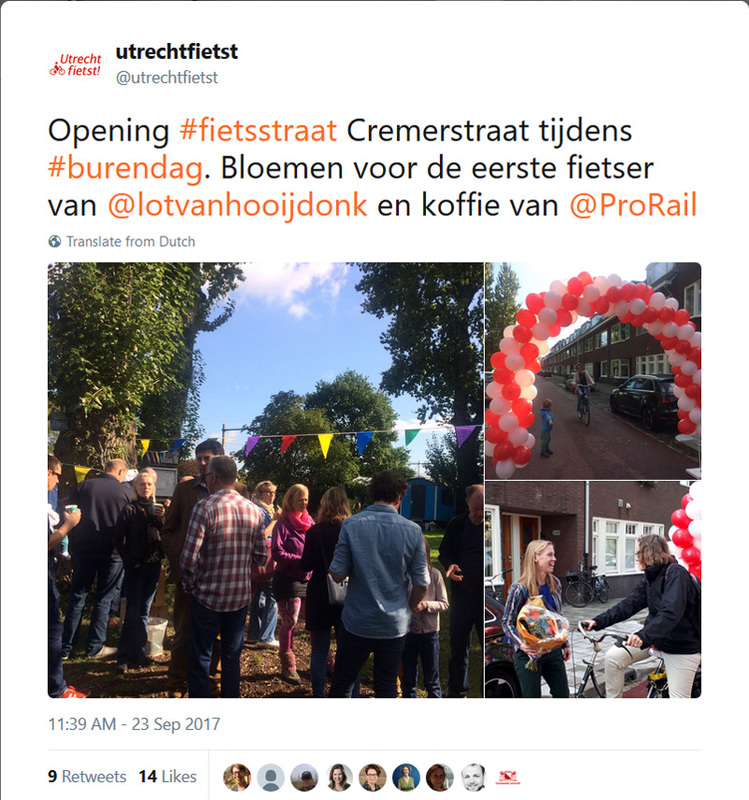 A proud tweet by Utrecht Fietst about the opening of the Cremerstraat in Utrecht. Showing some pictures of the festivities. The Utrecht Cremerstraat has been converted into a cycle street. The festive opening took place on Saturday 23rd of September last, when the municipal executive councillor for traffic, Lot van Hooijdonk, offered flowers to the “first user”. This marked the end of a project in which residents and other stakeholders had been involved since 2014. The city of Utrecht had organised three community events to inform everyone and to give people the opportunity to voice their concerns and give their ideas about the city’s preliminary plans. If you couldn’t make it to one of the information nights you could also leave your input on a website. The so-called ‘horizontal deflection” (a chicane) was removed. It was there to decrease speed for cars, but it was a nuisance for cycling, so it has no place in a cycle street. Not all residents were happy with this new “fast cycle route”. The word “fast” always confuses people. “We don’t want a bicycle freeway in our residential street!” some told the representatives of the city. But it is not the cycle speed that makes this a fast route, it is the fact that you can cycle without stopping. The smooth surface of red asphalt also makes a relatively high average speed possible without inconvenient bone shaking. Racing at speed is totally unnecessary and cycling will always take place at a lower speed than that of the cars also using the street. The so-called exit construction (with priority over the side-street) was replaced by a raised intersection where traffic from the right has priority. Strange, because the main cycle route was supposed to have priority. At some locations speed bumps were built where they didn’t exist before. Note that the roadway was widened here. The redesign was coordinated with two other projects in the area. The railway running parallel to the Cremerstraat just behind the park is currently being doubled from 2 to 4 tracks. The second project is the replacement of a main pipe line for the city’s heating system (that uses leftover industrial hot water to heat homes), also running parallel to the street and the railway. 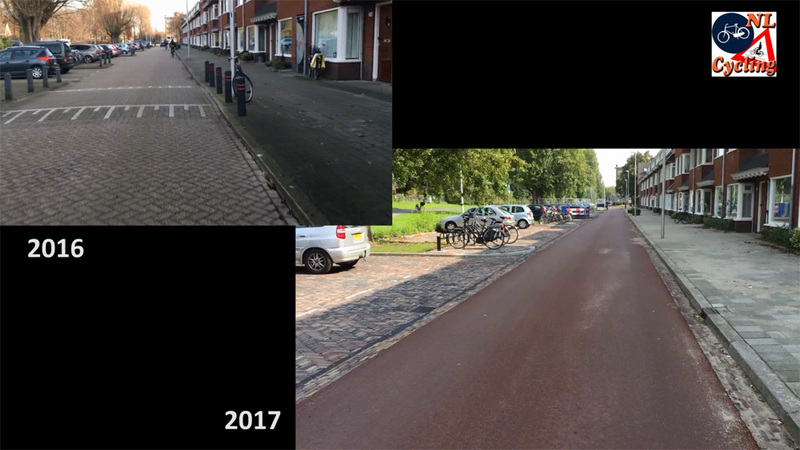 The redesign of the street is but a small project in comparison to those two projects. If you want to learn more about the why of this route, the report with the city’s answers to the stakeholders’ remarks about the preliminary design is a gold mine. Below is what the city answered to a number of questions put forward by mostly residents. 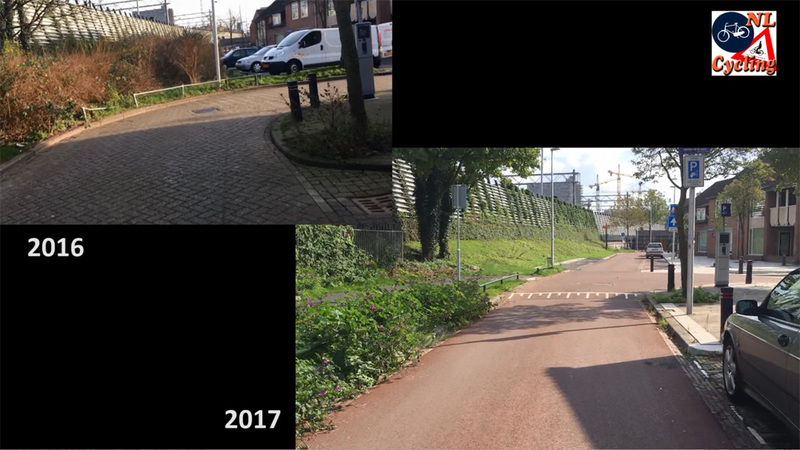 The situation of the parking lot before and after it had been reconstructed (from the other direction as the rendering). “Because of the new city expansion Leidsche Rijn many people now cycle between that residential area and the city centre. A high number of them uses the Cremerstraat. The Cremerstraat will be transformed into a cycle street because we want to add more safe and quiet routes to the existing cycle network. It will form an alternative to the busy Vleutenseweg. This increases the number of options for cycling. 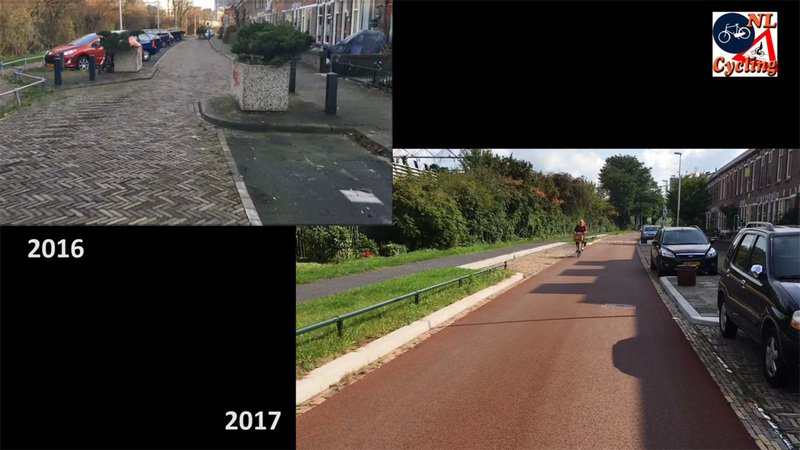 Recent cycle streets, such as Troelstralaan, Zandweg and Vaalserberg/Oeral/Hondsrug have been built in a comparable way. We think this design is fitting for this type of streets. That also goes for the Cremerstraat. Fast cycle routes are part of the urban main infrastructure. We do not only build that infrastructure for the residents of that particular area, but for all people cycling in Utrecht and the region. That means the interests of the residents cannot always prevail. The part of the street used by moving traffic is currently about 3 metres wide. In the design we will make that 3.5 metres with an extra brick strip of 0.2 metres on either side. This makes the street 3.9 metres wide [slightly narrower than the advised 4 metres] but an optimum had to be found in which we lose as little green space as possible. There are relatively few parking movements in the Cremerstraat and the motor traffic volume is low. Mainly residents park here because there are no shops or other amenities which would attract parking. Therefore, we feel the risk of dooring is very small and a width of 3.9 meters at the narrowest part is acceptable. We chose to build the speed bumps and raised intersections in brick, mainly to improve the visual aspect (not too much asphalt) and to make these parts stand out more. Raised intersections signal to road users that they approach a “special point”, more clearly than a traffic sign alone will. Drivers and cyclists in both the side streets and the Cremerstraat must take extra care here. This decreases the conflict speeds. A raised intersection also clearly belongs in a 30km/h zone, whereas exit constructions are usually used in the transition from 30km/h side streets to 50km/h main streets. At the location of the square the roadway was narrowed considerably. This tight curve was straightened out. Motor traffic must turn right here. So far no bollard was placed. This will be done if it turns out that motor traffic uses this cycle path as an illegal short-cut. We are very happy that the street will be updated. All current problems are taken care of! the strange winding route to get to the Daalsetunnel. Some changes were made to the plans because of the remarks of the residents. Especially the location of the bicycle parking racks was changed. Residents didn’t want racks near their homes on the sidewalk. They wanted them on the park side of the street. 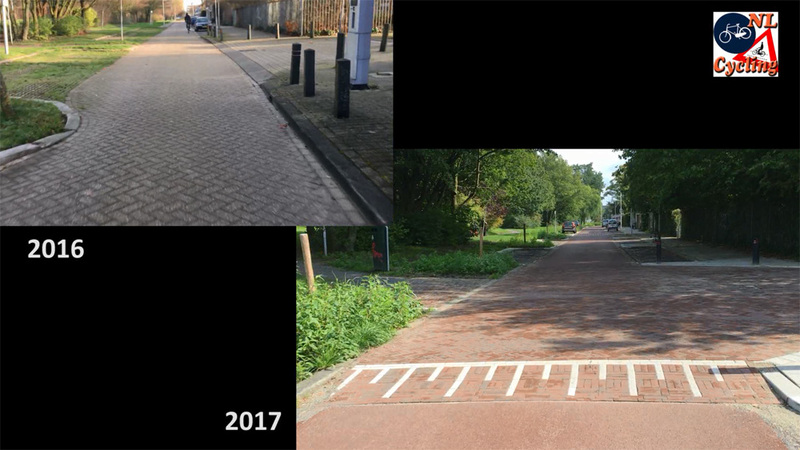 These changes were put in the final plan in March 2016 and on 5 July 2016 the Utrecht city council approved that final plan. At this location the roadway was widened and a new speed bump was placed. At this location the roadway was narrowed and the former speed bump was removed. 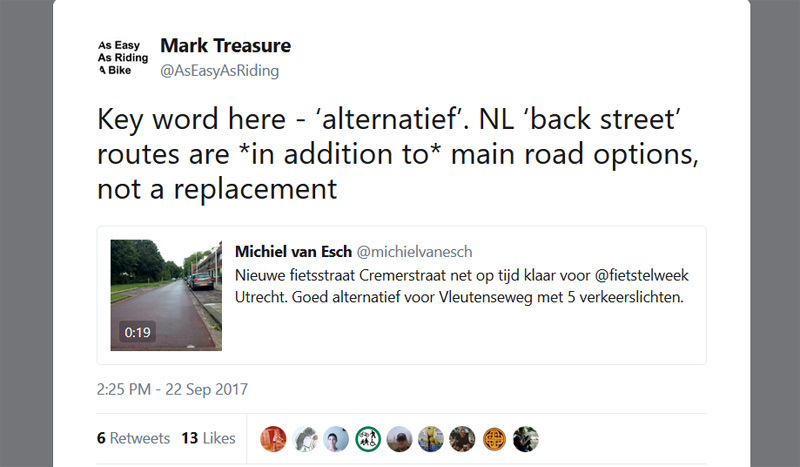 Now that everything was built, people complained with the Utrecht chapter of the Cyclists’ Union about some of the details of the reconstruction. 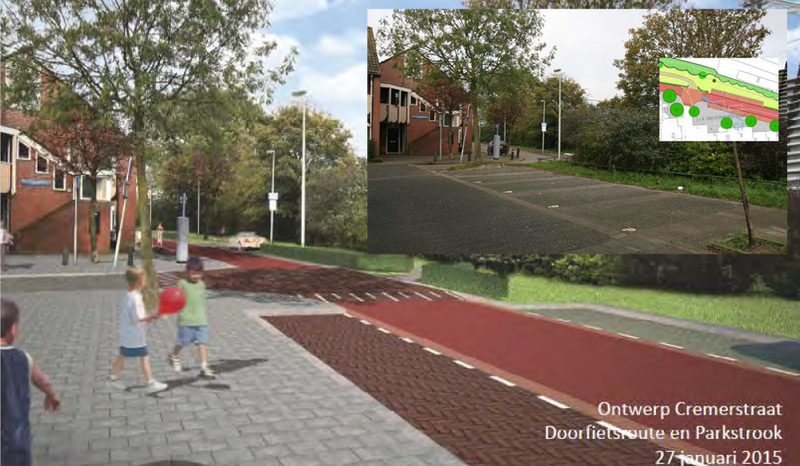 “The shape of the new speed bumps is not good enough” informed me Ria Glas, a representative of the Fietsersbond. “The bumps are simply a level change at an angle, very inconvenient. Well-designed speed bumps are sinus shaped. That makes cycling over them much more comfortable even if they are much higher, such as the ones in the side streets, which have been designed much better.” Another point of concern are the raised intersections. “As they are now they imply the basic priority rules are in place.” Which would mean every side street from the right would have the right of way over the Cremerstraat. “Strange, because the Cremerstraat was supposed to get that priority as a main cycle route. I wonder when the traffic signs regulating this will appear”, Ria wrote me in an e-mail. 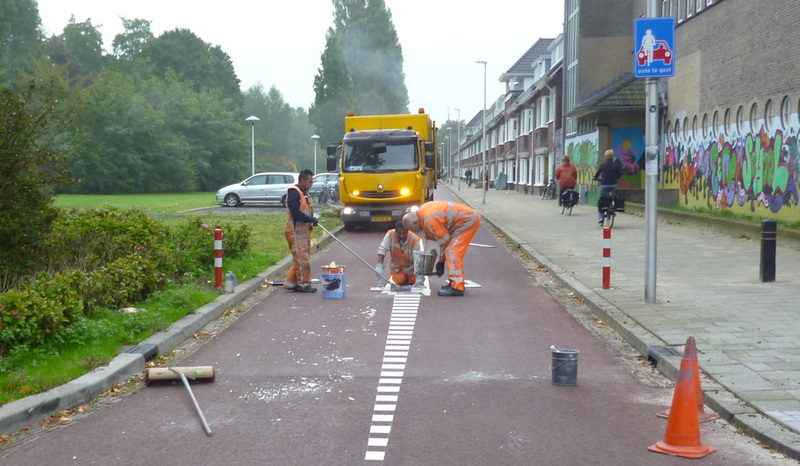 The preparation for a bollard that will not be placed any time soon, only if drivers will use this cycle path illegally. Picture Ria Glas. Ria Glas took a picture of work men placing a base for a bollard. This bollard is meant to break the street in two separate dead-end parts for motor traffic. The bollard would be clearly visible with the white markings, so that is not the problem, but there is too much space on either side. At just under 2 metres most cars could pass the future bollard. Regulations state that this space cannot be wider than 1.6 metres. The bollard was not placed yet. It will be when motor traffic uses the short cut illegally, but then the city will have to do something about that wide gap. But I think these are minor problems in such a big project. Mark Treasure, chair of the Cycling Embassy of Great Britain, wants you all to really understand that this quiet route was built in addition to an existing route alongside a main road, it isn’t the only cycle option. “Alternative” is the key word here, according to Mark. I cycled the new route and the alternative busy route, so you can see what it is like to cycle both those routes. Beginning and end in both videos are at the exact same location. In my videos the busy route was quicker, which is very unusual with 5 signalised intersections, but apparently it does happen that they are almost all green. 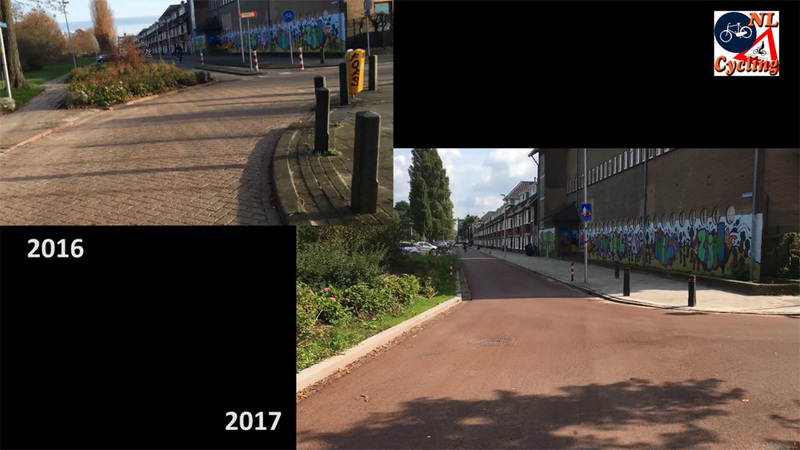 I also made a before and after video of just the Cremerstraat. This video is in real-time, so you can compare and see what changed to turn this route from some regular residential streets with different types of design into one recognisable convenient fast cycle route with a similar design from beginning to end. 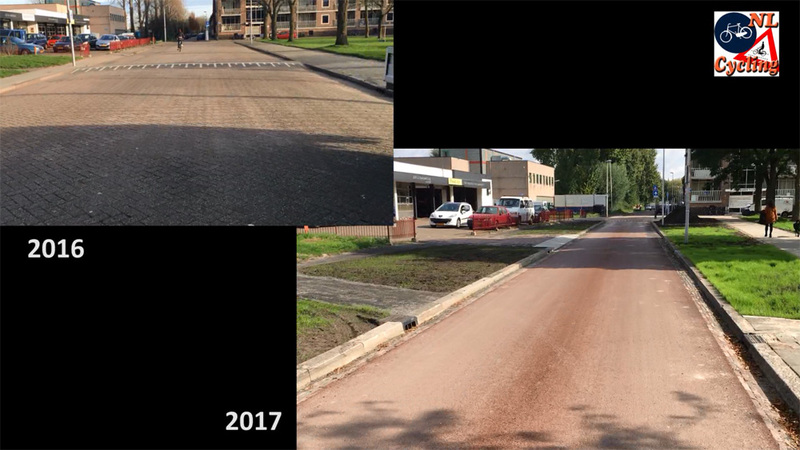 Before and After of Cremerstraat in Utrecht. Ride (sped-up) via the busy Vleutenseweg – with many traffic lights – to the Utrecht city centre. Ride (sped-up) via the new Cremerstraat Cycle Street to the Utrecht city centre. Google Map of both routes with the same beginning and end. The green line is the Cremerstraat, the purple line is the busy arterial Vleutenseweg. I cycled from west to east. I really enjoyed reading this post as I am using the Cremerstraat project for a master thesis. It is nice to read some background information. Thank you so much for the clear story. Thanks for this write up! You don’t mention if there was any change in the amount of car parking available in the area? It looks like the direct new street would reduce the parking spaces – is this the case, and if so how do the residents respond? Great post Mark; so many good things here for students and practitioners to learn as to how to do properly integrated, human-focussed, transport planning. As an Aussie visiting the Netherlands, the “Give Way to the Right” rule was confusing. As you know we drive on the LHS of the road and the motorist’s seat is on the RHS of the car, and we have always had the “Give Way to the Right” rule. So I was surprised that this wasn’t flipped on my visit, and thought it was just a quirk of the NL. Surprisingly to me, it seems Australia is the country with the quirky rule. Although I would say that Australia’s T-junction priority – where the person approaching on the stem of the T has to give way to all directions on the cross – seems to be a good, intuitive rule, and would be useful in the Cremerstraat situation if as you say, Council intended priority to be given to cyclists on Cremerstraat. I think Ria Glass has a point with the mid-block speed humps. If you look at the delay data for Cremerstraat there is a small delay at every hump. While this might have been due more to cyclists’ imagination than reality with the old hump’s shape – if what Ria claims is true that they were easier to ride over for cyclists – then the shape of the new humps make the delay/slowing prior to each one a necessity and therefore makes the delays real at these locations, which would appear to be at odds with the Council’s intentions of a “fast” route. Thank you again for another great post. You did not encounter a single car driving? Apparently not. As you can see it is one shot. So this is just what it is, a very quiet street. The ride on the arterial was filmed right after the quiet street ride. So you can also see what the difference is. Over 1.6m next to a bollard is typically not really a problem. It’s easy to ignore a sign ‘no through traffic’ and just pretend that your destination is along the road. But most people wouldn’t go through the effort of squeezing themselves past a bollard, except very occasionally (e.g. when lost). So the bollard will likely reduce through-traffic with 95%, and the few that squeeze past will make themselves look dumb and might get angry looks, which is typically enough to avoid doing it again. Why would it be illegal for a car te enter the Cremerstraat near the crossing with Justus van Maurikstraat? In the old situation this was indeed for a couple of meters a cycle path. In the new situation the traffic sign however is one of a fietsstraat (where cars are allowed). You are right, as the signage is now it would be allowed for a driver to enter there with a car. But the plans state otherwise. It seems the signage was not completely finished and correct when I filmed (some days before the official opening). Amazing as always, is there ever much resistance to these projects? 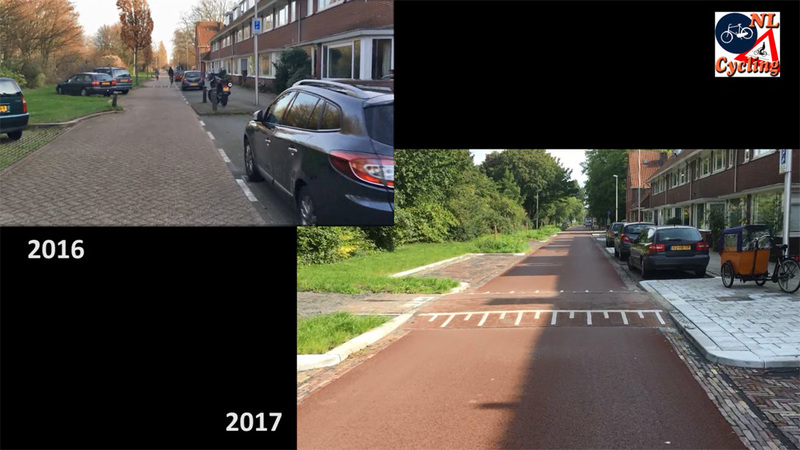 This entry was posted on 10 October 2017 by Bicycle Dutch in Original posts and tagged before and after, cycle streets (Fietsstraat), Utrecht.